I was amazed to receive a link to a survey from a company I had a single email exchange with earlier this week. Being in the business I’m in, I always like to see how companies are asking for feedback, so I clicked it. Maybe not in the email exchange, but this survey is demanding I exert rather a lot of effort!! 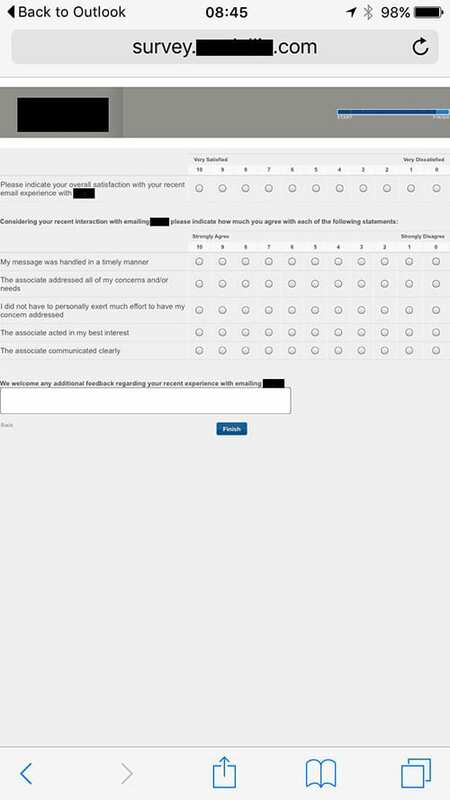 When the survey takes longer to complete than the customer interaction, surely CX professionals should start to question if this approach is the right one? What made it worse, like so many professionals on the move, I received this on my not-exactly-small iPhone 6 plus (the above is a direct screenshot of how it appears on my phone) and still found the radio buttons incredibly fiddly. Needless to say I didn’t manage to complete the survey. What this company will never know is, is that the service I experienced from the person at the hotel was very good indeed, and I would have been very happy to feed back if they had provided me with a sensible way to do so. Sadly this mechanism wasn’t the right one. Surveys themselves are a big part of how the customer perceives you. Whilst it’s OK to ask many survey questions in some (limited) instances, on a transactional level, in a situation like this, it’s bordering on the absurd. I had ONE email exchange with this company but am asked SIX questions by return, as well as a free form text box? Surely that’s not a fair ask of me as a customer? Isn’t my time worth more than that? Getting agent feedback is valuable and when done correctly, can be transformative but making it a burden on the customer is not OK. You can’t copy and paste market research style questions into a fast-paced customer support environment. I’ll be reaching out to this company and suggesting a more appropriate 1-click approach they could have added to their signature file…. It’s faster, easier to complete on a mobile, more fun for the customer and the agent, and gets infinitely better response rates.